Rabbit recombinant monoclonal STAT6 antibody [YE361]. Validated in WB, IP, IHC, Flow Cyt, ICC/IF and tested in Mouse, Human. Cited in 14 publication(s). Independently reviewed in 1 review(s). The antibody does not cross-react with other Stat family members. Synthetic peptide within Human STAT6 aa 800 to the C-terminus (C terminal). The exact sequence is proprietary. WB: Raji, NIH/3T3 and RAW 264.7 cell lysates. IHC-P: Human skin carcinoma, kidney, transitional cell carcinoma of bladder, glioma and solitary fibrous tumor tissues; Mouse kidney tissue. ICC/IF: HeLa cells. Flow Cyt: HeLa cells. IP: NIH/3T3 cell lysate. Our Abpromise guarantee covers the use of ab32520 in the following tested applications. WB 1/1000 - 1/2000. Detects a band of approximately 100 kDa (predicted molecular weight: 94 kDa). Carries out a dual function: signal transduction and activation of transcription. Involved in interleukin-4 signalling. Belongs to the transcription factor STAT family. Tyrosine phosphorylated following stimulation by IL-4 and IL-3. Cytoplasm. Nucleus. Translocated into the nucleus in response to phosphorylation. Immunohistochemical staining of paraffin embedded human kidney with purified ab32520 at a working dilution of 1/50. The secondary antibody used is HRP goat anti-rabbit IgG H&L (ab97051) at 1/500. The sample is counter-stained with hematoxylin. Antigen retrieval was perfomed using Tris-EDTA buffer, pH 9.0. PBS was used instead of the primary antibody as the negative control, and is shown in the inset. Immunofluorescence staining of HeLa (human epithelial cell line from cervix adenocarcinoma) cells with purified ab32520 at a working dilution of 1/100, counter-stained with DAPI. The secondary antibody was Alexa Fluor® 488 goat anti-rabbit (ab150077), used at a dilution of 1/1000. ab7291, a mouse anti-tubulin antibody (1/1000), was used to stain tubulin along with ab150120 (Alexa Fluor® 594 goat anti-mouse, 1/1000), shown in the top right hand panel. The cells were fixed in 4% PFA and permeabilized using 0.1% Triton X 100. The negative controls are shown in bottom middle and right hand panels - for negative control 1, purified ab32520 was used at a dilution of 1/500 followed by an Alexa Fluor® 594 goat anti-mouse antibody (ab150120) at a dilution of 1/500. For negative control 2, ab7291 (mouse anti-tubulin) was used at a dilution of 1/500 followed by an Alexa Fluor® 488 goat anti-rabbit antibody (ab150077) at a dilution of 1/400. Flow Cytometry analysis of HeLa (human epithelial cell line from cervix adenocarcinoma) cells labeling STAT6 with purified ab32520 at 1/30 dilution(10ug/ml) (red). Cells were fixed with 4% paraformaldehyde and permeabilised with 90% methanol. A Goat anti rabbit IgG (Alexa Fluor® 488)(1:2000 dilution) was used as the secondary antibody. Rabbit monoclonal IgG (Black) was used as the isotype control, cells without incubation with primary antibody and secondary antibody (Blue) was used as the unlabeled control. Immunohistochemistry (Formalin/PFA-fixed paraffin-embedded sections) analysis of human skin carcinoma tissue labelling STAT6 with unpurified ab32520 at 1/100. Immunohistochemistry (Formalin/PFA-fixed paraffin-embedded sections) analysis of mouse kidney tissue sections labelling STAT6 with unpurified ab32520 at a dilution of 1/1000. HRP goat anti-rabbit (ab97051) was used at a dilution of 1/500. The antigen retrieval solution was Tris-EDTA buffer, pH 9.0. Immunocytochemistry/Immunofluorescence analyis of HeLa (human epithelial cell line from cervix adenocarcinoma) cells labelling STAT6 with unpurified ab32520 at 1/100. Immunohistochemistry (Formalin/PFA-fixed paraffin-embedded sections) analysis of human transitional cell carcinoma of bladder tissue sections labelling STAT6 with unpurified ab32520 at a dilution of 1/1000. HRP goat anti-rabbit (ab97051) was used at a dilution of 1/500. The antigen retrieval solution was Tris-EDTA buffer, pH 9.0. Immunohistochemistry (Formalin/PFA-fixed paraffin-embedded sections) analysis of human glioma tissue sections labelling STAT6 with unpurified ab32520 at a dilution of 1/1000. HRP goat anti-rabbit (ab97051) was used at a dilution of 1/500. The antigen retrieval solution was Tris-EDTA buffer, pH 9.0. Immunohistochemistry (Formalin/PFA-fixed paraffin-embedded sections) analysis of human kidney tissue sections labelling STAT6 with unpurified ab32520 at a dilution of 1/1000. HRP goat anti-rabbit (ab97051) was used at a dilution of 1/500. The antigen retrieval solution was Tris-EDTA buffer, pH 9.0. Immunohistochemistry (Formalin/PFA-fixed paraffin-embedded sections) analysis of human solitary fibrous tumor tissue sections labelling STAT6 with unpurified ab32520 at a dilution of 1/1000. HRP goat anti-rabbit (ab97051) was used at a dilution of 1/500. The antigen retrieval solution was Tris-EDTA buffer, pH 9.0. Publishing research using ab32520? Please let us know so that we can cite the reference in this datasheet. I’m currently evaluating abcam’s antibody STAT6 Clone:YE361 Catalog#: ab32520. Could you please tell me if this Rabbit Monoclonal antibody is from an Ascites source or supernatant source? The antibody is from tissue culture supernatant. The customer would like to try positive control. They will try ab109255 IRF7 antibody, on Jurkat cell lysate, but they do not have NIH3T3 for ab32520 STAT6 antibody. Could you please suggest other human cell lysate as the positive control for ab32520 STAT6 antibody? The Jurkat lysate will serve as a positive control for STAT6, in addition to IRF7. Although ab32520 has not been tested on Jurkat, other STAT6 antibodies have been, and the results demonstrate that Jurkat expresses this protein. 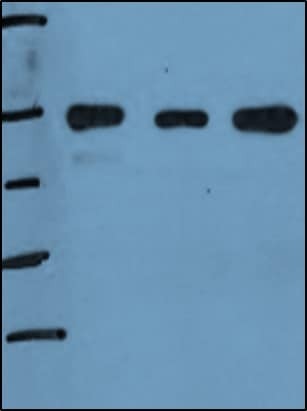 For an example western blot of Jurkat stained for STAT6, please see the datasheet for ab125303: https://www.abcam.com/stat6-antibody-ab125303.html. 2. Is not possible, blocking agents are included in the detection kit provided by Ventana/Roche. There are no options to separate blocking agents. 3. Is not possible to incubate at 4°C with a Ventana Benchmarck system. 4. Secundairy Ab in detection kit is working with other primary antibodies. Our collaborators from Nijmegen used the same antibody in the same setting with good results. Therefore we would like to give it another try with the same antibody. Could you please send us a new vial with anti-STAT6? We will try again on the same and some new tissues. I will keep you informed how we will get on with it. Thank you very much for your kind help. Thank you for confirming these details and for your cooperation. The details provided enable us to closely monitor the quality of our products. I am sorry this product did not perform as stated on the datasheet and for the inconvenience this has caused. As requested, I have issued a free of charge replacement with the order number 1180962. Please find enclosed the answers to your questions. I hope these answers will help in finding a solution to the none working antibody. Thank you in advance for looking into it. If you need high resolution pictures, please let me know. Blocking conditions (Buffer/time period, Blocking agent etc.) automatical via detection kit, 3% H2O2 to inhibit endogenous peroxydase, t= 4 min, protein block directly with incubatie secundairy Ab with goat serum and casein t = 8 min. Primary Antibody (Manufacturer/Species/Diluent/Dilution/Incubation time, Wash step), Rabbit anti STAT6 (ab32520), ABCAM, used dilution from 1:50 till 1:500 incubated 32 min at 37C and once 1:50 incubated 90 min at 37C. Secondary Antibody (Manufacturer/Species/Diluent/Dilution/Incubation time, Wash step) Ultraview Multimer Ig, Ready to use mixture of Goat anti Mouse IgG, Goat anti mouse IgM, Goat anti Rabbit IgG, simultaneus with protein block. t=8 min. Positive and negative controls used (please specify): above mentioned tissue are used as a positive control for optimalisation steps. Have you run a No Primary control? No, not neccesary, while their is no signal. Only run this step when obtaining huge background. What steps have you altered? changing antibody dilution, incubation time, antigen retrieval method, time of antigen retrieval and tissue. Thank you for taking the time to complete our questionnaire and contact us. The details you have kindly provided will provide us with vital information for our monitoring of product quality. I appreciate the time you have spent in the laboratory and understand your concerns. It is regrettable the results have not been successful. Reviewing the details. 1. The time for antigen retrieval can sometimes require some optimization. For example I can recommend to try , 5, 10 and 20 minutes if this has not already been done. 2. We recommend not to mix blocking agents in one experiment. I can recommend to try serum only (no casein). 3. I can suggest to try overnight incubation at 4oC. This sometimes provides more specific and efficient staining. 4. Could you confirm if the current vial of secondary antibody is working well with other primary antibodies? Alternatively, or if these tips do not work, I am pleased to offer you a free of charge replacement or credit note in compensation. On the 10th of August I received from you the antibody with product number ab32520 (Rabbit monoclonal [YE361] to STAT6). We have tested this antibody using immunohistochemistry on prostate carcinoma, human skin, breast carcinoma and non-hodgkin's lymphoma. Unfortunately none of these tissues show any signal, not even background staining. Immunohistochemistry was performed with a Ventana IHC system by Roche using both TRIS and Citrate buffers and different antigen retrieval times. Concentrations used ranged from 1:25 till 1:500. Alongside your antibody we used other anti-STAT antibodies that did show a signal. The antibody was handled as advised by you upon arrival (aliquoted and frozen at -20oC). It appears that this antibody is not functioning properly. Could you please give us some advise how to test the antibody? Or could you verify if something is wrong with this lot? Thank you for your help in advance. Thank you for taking the time to contact us. I am sorry to hear you have had difficulty obtaining satisfactory results from this antibody. I would like to reassure you that we monitor feedback closely on a weekly basis and we are not currently concerned about the general quality of this antibody or this batch. I would also like to reassure you that this antibody is tested and covered by our 6 month guarantee for IHC-P and human samples. In the event that a product is not functioning in the tested applications and species cited on the product data sheet (and the problem has been reported within 6 months of purchase), we will be pleased to provide a credit note, free of charge replacement or refund. I would like to investigate this particular case further for you, and also obtain more information for our quality monitoring records. In order to proceed with this, I have enclosed a technical questionnaire below. I would appreciate if you could complete this. It will help you put the information we require together very easily. I would appreciate if you could also provide an image which would help us to assess the results. Thank you for your time and cooperation. We look forward to receiving the completed questionaire. How many times have you tried the IHC? Have you run a "No Primary" control? Do you obtain the same results every time? I have been using this antibody in WB and getting a very weak signal, especially in comparison to phospho-STAT6. Can I try ab44718? Thank you for contacting Abcam regarding ab32520. I am sorry this product did not perform as stated on the datasheet and for the inconvenience this has caused. As requested, I have issued a free of charge replacement. What method of antigen retrieval was used with this antibody in IHC-P? Thank you for your reply. For ab32520, HIER using Citrate buffer pH 6 was used as the pretreatment on FFPE tissue. You may find a protocol for this at the following link: https://www.abcam.com/assets/pdf/protocols/IHC-paraffin%20protocol%20(IHC-P).pdf I hope this information helps. Please do not hesitate to contact us if you need anything further.